Ever since graduation, when Santana Dark leaned over and kissed the brainy and shy Emma Glass, she has been smitten with the dark, brooding hunk. She thought about him while he served overseas, while she stayed home in Star Canyon, New Mexico, and tended to its animals. Now he is back, ready to retake his place with his three brothers and his spitfire of a sister at the family ranch. 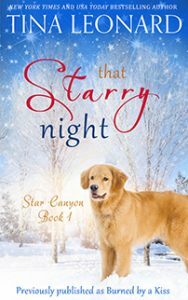 A stranger arrives in Star Canyon, a cousin to the Dark family though they’ve never met this wealthy stranger, claiming to hold the legal title to the family ranch now that their father has seemingly died in a mysterious fire. With his world spiraling out, Santana finds solace and comfort in Emma’s arms, and she finds heat and passion in his. But will their love be consumed by the secrets of the past?